I love breakfast. It is my favorite meal of the day. I don’t know if it’s because I also love mornings that I love breakfast or if it is because there are so many yummy breakfast foods to choose from! Pancakes, eggs, bacon, oatmeal, waffles, cereal and toast! Oh and crepes, crepes are delicious, with all the different yummy fillings you can put inside. Yummy! It’s no wonder that sometimes I like making ‘breakfast’ for supper. Not only is it easy and fast but it is a nice treat. I usually add in some fruit of some kind or maybe a veg depending what I am actually making, but you can never go wrong. The kids always gobble it up and get very excited when they hear that we are having pancakes or waffles for dinner. In fact Luke and Chloe start clapping, jumping and screaming in delight. (I do too actually, on the inside). As with other foods that are our favorites I have had to adjust these recipes to a dairy and sugar free version, which is quite easy to do. By now I have got the substitutions for things down pat and am able to take any recipe and make the appropriate adjustments. Last night we had waffles for supper. 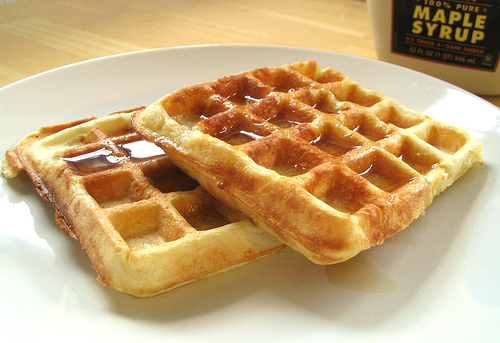 Waffles have always been one of my favorites, maybe because of the funky shape they come out in, maybe because it is another ‘bread’ type food and that is definitely one of my comfort foods. I like waffles because you can put so many things on them. 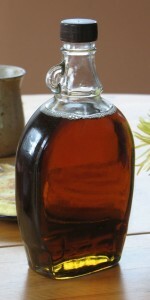 You can put on the traditional butter and maple syrup or top it with fruit and ice cream or whip cream. I always find it fun as well to fill each little square with something. 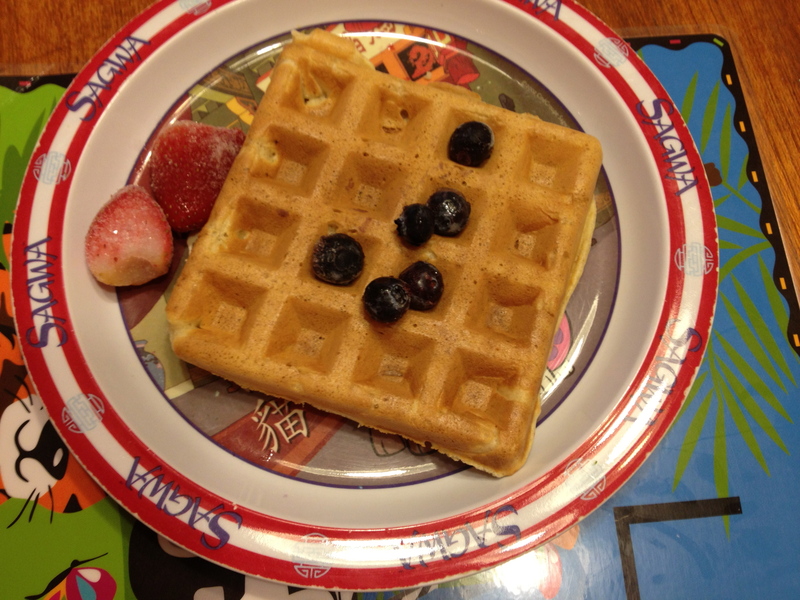 Yesterday I watched Luke do just that as he took blueberries and put one in each square of his waffle. I have substituted date sugar in these recipes but have also used coconut sugar, which I tried with the plain waffles for the first time last night. Though they turned out lovely and tasted great, for some reason I enjoy the ones with date sugar better. Depending on your taste preferences you may choose to use one over the other as well. 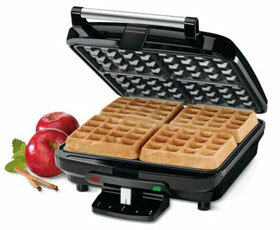 You do need a waffle iron to make waffles of course and my recommendation is to go with a non stick one. It is so easy to clean afterwards, you just wipe it down with hot soapy water. Sometimes I brush a little Earth Balance Vegan Spread over the plates before I make the first batch of waffles, but that’s it – after that they are stick free and easy clean up! 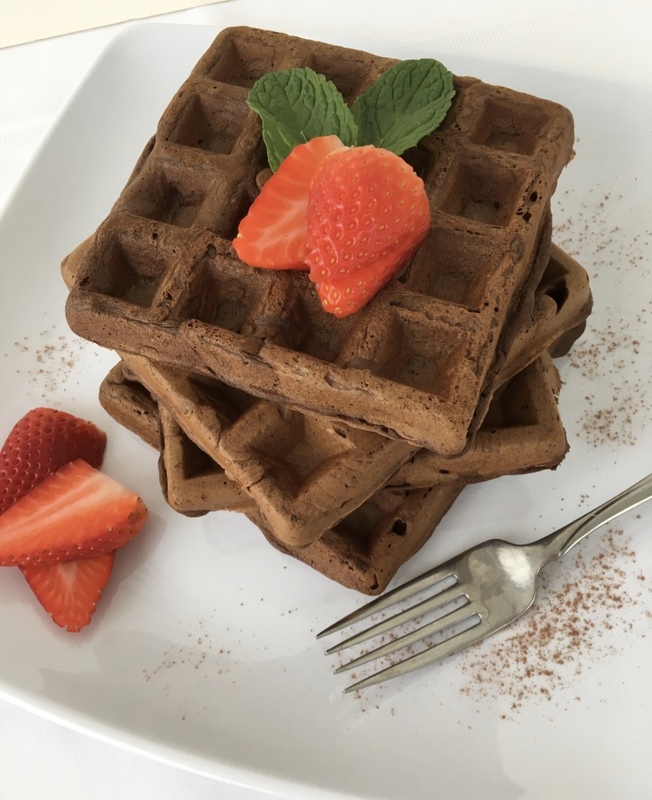 So whether you are having breakfast or supper, try out these waffle recipes and enjoy them guilt free! Stir first 4 ingredients together in a bowl. Make a well. Beat egg whites until stiff. Using the same beaters, beat egg yolks in separate bowl. Add Earth Balance and milk, mix. Pour into well. Fold in beaten eggs whites. Cook in hot waffle iron until browned, using about 1/3 c. batter for each. Beat egg in bowl. Add milk, cooking oil and vanilla. Beat in. Add next 6 ingredients, mix. Cook in hot waffle iron until crisp, using 1/3 c. batter for each. Measure first 4 ingredients into bowl. Stir together. Add butter, egg yolks and orange juice. Mix lightly. Beat egg whites together in a small bowl until stiff. Fold into batter. Cook in hot waffle iron until browned using 1/3 c. batter for each. Arrange waffles on plates, sift icing sugar over top if using. 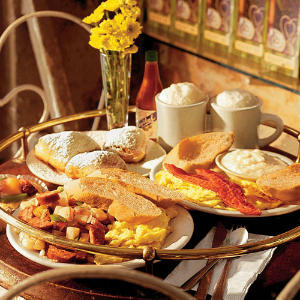 All original recipes are from Company’s Coming Breakfast and Brunches. These recipes have been modified to a dairy free and sugar free recipe. This entry was posted in Breakfast, Healthy Eating, Recipes, Sugar Free and tagged almond milk, bacon, breakfast foods, cereal, chocolate waffles, coconut sugar, comfort foods, Company's Coming, crepes, dairy free, date sugar, Earth Balance, eggs, oatmeal, orange dessert waffles, pancakes, plain waffles, recipes, rice milk, sugar free, sugar free waffle recipe, toast, waffles by Carmen. Bookmark the permalink.